The Danville Police Department is looking for information on a suspect in connection with a package theft that occurred earlier today. Police responded to Old Orchard Ct in the Sycamore neighborhood for a report of a package theft. The suspect in the theft is described as a white male, average height/weight, wearing a gray zip up sweater, black pants, and sunglasses. 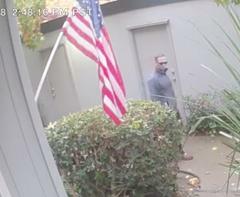 The suspect is seen on surveillance video walking up to the front door and taking a package from the doorstep before walking away. Anyone with information on this incident is encouraged to contact Sgt. Ron Hoekwater at (925) 314-3703 or rhoekwater@Danville.ca.gov.